Conforms to EN ISO 20345. SRC rated slip resistant sole. Hard wearing Chelsea dealer safety boots. Stainless steel toe cap, tested to 200 Joules of impact. Sole heat resistant up to 300c for one minute. Hard working and stylish safety boots. Available in UK sizes 6 - 12. Caterpillar CAT Pelton Brown Steel Toe Cap Safety S1P SRC Chelsea Dealer Boots. 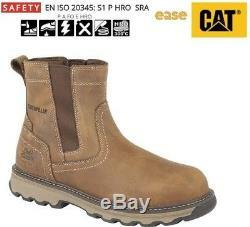 CATERPILLAR CAT PELTON DEALER LEATHER SAFETY BOOTS. CAT PELTON LEATHER SAFETY WORK BOOTS RUBBER OUTER SOLES STEEL TOE CAP ANTI PENETRATION MIDSOLE SOLE SAWHORSE LEATHER DEALER BOOTS. SIZE 6,7,8,9,10,11,12 UK SAFETY EN ISO 20345 SB P SRC BROWN OIL LEATHER EASE EVE SUPERIOR COMFORT WICKERING REMOVABLE INSOLES. Everything is checked Prior to sending & we security label all our items. If you want to cancel or return an item. Non fitting / Change of mind / Exchanges you have 14 calendar days for the item to reach us. G unworn, all packaging intact and the box not taped up or wrote on. Inappropriate size to us as we cannot guarantee sizes will be in stock on demand. Please do not send the item back before you have contacted us. Item must be unworn and in original condition (apart from trying on carpeted surfaces). The return must be in its original box and must be repackaged with no tape attached to the box itself. You are responsible for the item until we have received them back, sp we do suggest using a tracked service. We provide a simple, one-stop shop for all your footwear needs whatever your sense of style or budget. We are also stockists of wide fit shoes, Slippers , Mens & Childrens shoes. Get images that make Supersized seem small. Tailor your auctions with Auctiva's. The item "Caterpillar CAT Pelton Brown Steel Toe Cap Safety S1P SRC Chelsea Dealer Boots" is in sale since Saturday, September 29, 2018. This item is in the category "Clothes, Shoes & Accessories\Men's Shoes\Boots". The seller is "highfield-lane" and is located in BOURNEMOUTH. This item can be shipped to United Kingdom, United States, Japan, Canada, Ireland, Australia, Germany, France, Greece, Italy, Spain, Austria, Belgium, Bulgaria, Croatia, Cyprus, Czech republic, Denmark, Estonia, Finland, Hungary, Latvia, Lithuania, Luxembourg, Malta, Netherlands, Poland, Portugal, Romania, Slovakia, Slovenia, Sweden, Brazil, New Zealand, China, Israel, Hong Kong, Norway, Malaysia, Mexico, Singapore, South Korea, Switzerland, Taiwan, Thailand, Chile.